How to Measure Men's Shirt Size? 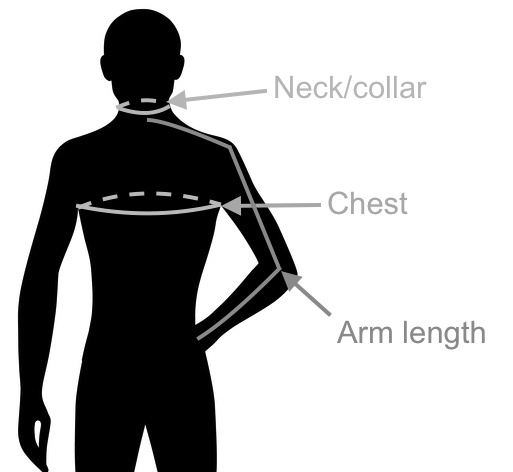 Neck/collar: Measure circumference around your neck, at the Adam's apple. Keep the measuring tape a little bit loose. Arm length: Ask a friend or family member for help measuring your arm length. Bend your arm 90 degrees and place it on your hip (just like in the illustration above). Measure from the center back of your neck, across your sholder, via your elbow and down to your wrist. Tips, Tricks or Questions about Men's US/UK Shirt Size? Tips, tricks or questions about men's US/UK dress shirt sizing? Please post below. Thanks!